The South Side Slopes Neighborhood Association is happy to announce the addition of Laura Officer to the Board of Directors. Originally from Mt. Lebanon, Laura moved to the South Side Slopes in 2011. She works at Greater Pittsburgh Community Food Bank, where the mission is to feed people in need and mobilize our community to eliminate hunger. Laura works directly with over 100 food assistance programs, some of which are located in the South Side Slopes, South Side Flats, and Hilltop communities. Laura brings her expertise in Non-Profit Management to the Board as well as experience in program evaluation, grant writing and strategic planning. Laura is replacing Jamin Bogi who stepped down from the Board last month. We thank Jamin for his dedication to the South Side Slopes, and we know he will continue to contribute to the Slopes neighborhood with his regular clean-ups, pruning, reporting issues to 311, and more! The city is holding a capital budget hearing on Tuesday June 22. This is your chance to tell the city how to spend their money in 2016. This year, the hearing will follow a new format that gives residents the chance to learn more about what goes into the Capital Budget, discuss needs and priorities in a small-group setting, and ask questions of an expert panel. Residents will also have the chance to let the City know of specific Capital work in their neighborhoods that they would like to see done in 2016. Monday June 22, at the South Side Market House, 1 Bedford Square. The event will be held from 6:00-8:30 PM, and refreshments will be provided. The city asks that residents pre-­register by filling out the following form (walk-­in registration will be available on the day of the forum). The South Side Welcome Center needs your help! In 2 years the South Side Welcome Center has established itself as the go to place for information, volunteerism, & positive energy in the South Side. The Welcome Center has produced and featured information on the South Side Slopes, our City Steps and South Side Park. The Welcome Center has also been a partner in several initiatives of the South Side Slopes Neighborhood Association including StepTrek. It takes funding and a monumental volunteer effort to keep the South Side Welcome Center open and staffed. Please consider a donation today! For more information or to join the South Side Chamber of Commerce, stop by their welcome center or visit their website. 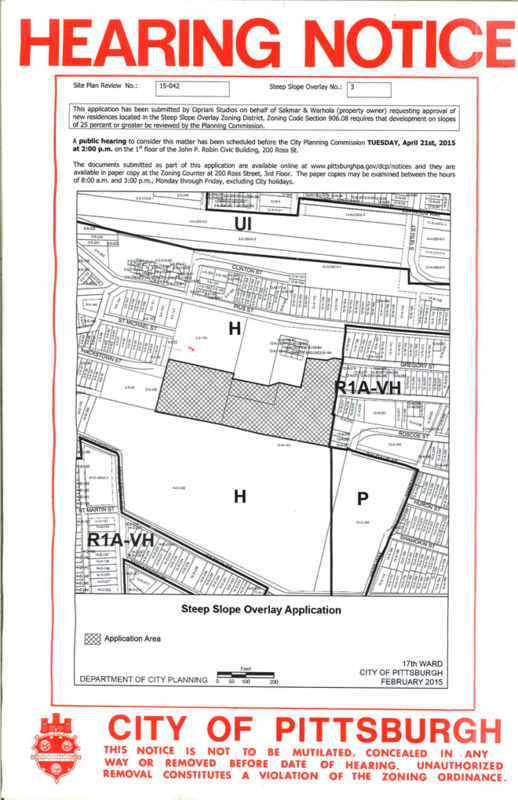 An application has been submitted by Cipriani Studios on behalf of Salmar & Warhola (property owner) requesting approval of new residences located in the Steep Slope Overlay Zoning District. Zoning Code Section 906.08 requires that development on slopes of 25 percent or greater be reviewed by the Planning Commission. If you are interested in attending, there is a public hearing on Tuesday April 21, 2015 at 2PM on the 1st floor of the John P. Robin Civic Building, 200 Ross St.
Want an excuse to get some exercise, meet people, and explore South Side Park? Walk with us! 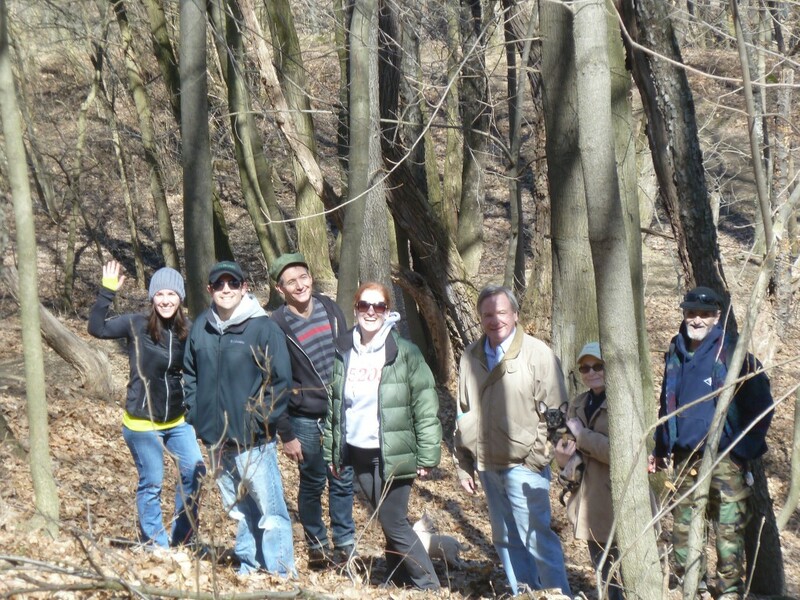 The South Side Park Walking Club has twice monthly guided walks in the park. WHERE: We meet in the parking lot on Mission Street between the bridges. WHO: People of all ages and leashed dogs are welcome. CAN I DO IT? We follow a trail in the woods. The speed of the walks are adjusted to the level of who shows up, and there is no cost or obligation. We just want to encourage people to use South Side Park.